eat sleep cuddle. : too. many. books. 1. This book is pretty new to the collection. I've only used 1 page so far and I think it might become my new "schedule book." 2. This is my current schedule and/or sketch book. 3. My spiritual thoughts/insights journal (straight from Florence, Italy). 5. My real journal...I finished my other one a few weeks ago and since using this new one I've written in it every single day! And being in a Bookbinding class (learning how to make books) probably isn't helping either. 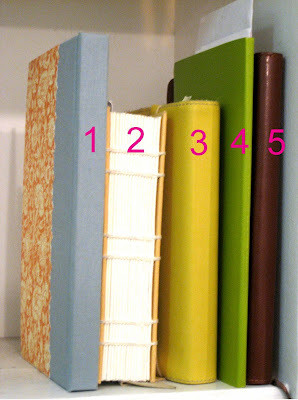 Books #1 and #2 are completely homemade! :) Homemade book #3 will be done next week. I think I'll use it for favorite recipes and stuff.